After attending Mississippi State University for two years in the pre-nursing program, Ms. Ferguson earned her Bachelor of Science in Nursing from Mississippi University for Women. 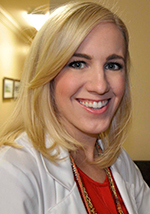 Ms. Ferguson furthered her education by receiving a Masters of Science in Nursing, Family Nurse Practitioner degree from Mississippi University for Women in 2015. In August of 2015, she earned her certification through the American Academy of Nurse Practitioners.